HP Umpire Tim Welke (crew chief): This is Tim Welke's third career All-Star Game and first behind home plate as a crew chief (1990, RF; 2005, 1B). 2015 Ejections: 0. 2015 Replays: 4 Affirmed / 10 Total = .400 RAP. 2014 UEFL Award: Worst Umpire of Year. 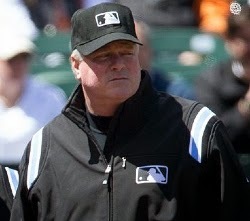 1B Umpire Jerry Meals: This is Jerry Meals' second career All-Star Game, first as a regular season crew chief (2002, 3B). 2015 Ejections: 0. 2015 Replays: 4/10 = .400 RAP. 2B Umpire Paul Schrieber: Second career All-Star Game (2000, 3B). 2015 Ejections: 0. 2015 Replays: 2/6 = .333 RAP. 3B Umpire Ron Kulpa: Second career All-Star Game (2001, LF). 2015 Ejections: 1 (E-111, 6/28). 2015 Replays: 6/11 = .545 RAP. LF Umpire James Hoye: First All-Star Game. 2015 Ejections: 2 (E-018, 4/19; E-073, 6/3). 2015 Replays: 6/10 = .600 RAP. RF Umpire Alan Porter: First All-Star Game. 2015 Ejections 1 (E-107, 6/24; S-12, 3/31). 2015 Replays: 2/2 = 1.000 RAP. Replay Official Brian Gorman: His first All-Star Replay assignment. 2015 Ejections: 1 (E-074, 6/4). 2015 Replays: 4/5 = .800 RAP. Alan Porter = T-1st (technically T-3rd due to tiebreaker of number of replays experienced). Reserves: Kerwin Danley (6/7), Paul Emmel (4/5), David Rackley (4/5), Marvin Hudson (3/4), Mark Ripperger (3/4), Fieldin Culbreth (5/7), Mark Wegner (5/7), Joe West (5/7). *Pat Hoberg (T-1st [3rd], 2/2) and Adam Hamari (8th, 9/11) not eligible due to AAA status. Pursuant to UEFL Rule 2-2-a, all All-Star Game umpires will receive one League point for appearing in the contest while Welke will receive two points for his role as crew chief. No points are awarded to the Replay Official (must "appear in that game"). HP Umpire Ron Teague (AAA, PCL [Freshly Promoted from AA-Texas League]), 1B Umpire Dan Merzel (AA, Eastern League), 2B Umpire Javerro January (AA, Southern League), 3B Umpire Junior Valentine (AA, Eastern League). All will work the Home Run Derby while January and Valentine will officiate Sunday's Legends and Celebrity Softball Game.